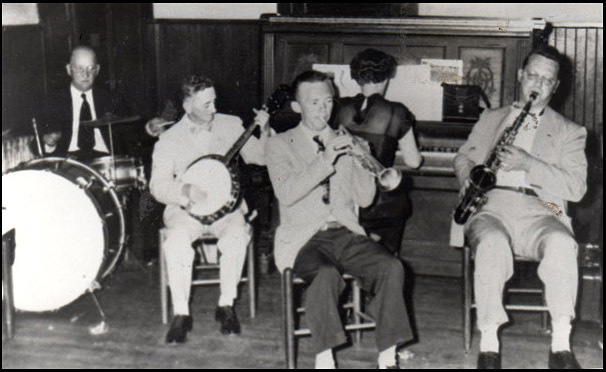 Comments: Shown above is the Scottsville Orchestra playing at a Scottsville High School dance in 1952: (L to R) John Henry Phillips (drums), Wiley Anderson (banjo), Carter Conrad (trumpet), Ruth Kent Pitts (piano), and Jack Miller (saxophone). 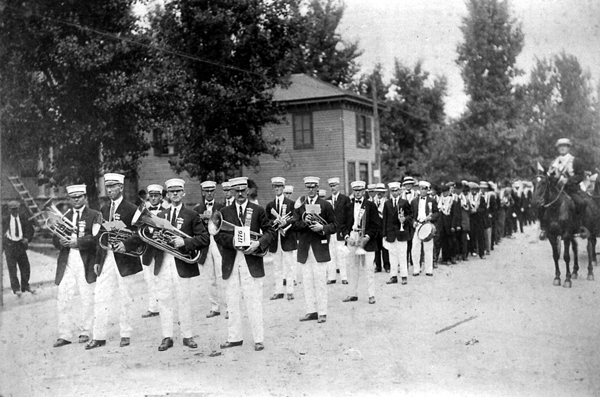 As Robert Spencer, a Scottsville native and former town mayor, minister, teacher, newspaperman, and magician, remembers, this orchestra was memorable for both the frequency of its performances and the beauty and class of its sound: "The Scottsville Orchestra performed near and far for years. 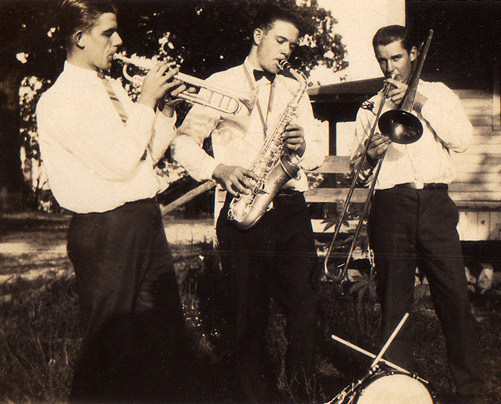 Its members played for every school dance, every event at Victory Hall and the Canal Warehouse, every club and fund raiser, and public dances in Charlottesville, Richmond, and other venues." Robert also remembers the sound of country music emanating from Victory Hall in the 1950's. "I vividly recall the sounds of country music at Victory Hall when performers came to Scottsville enroute to Nashville and the stage at the Grand Ole Opry. Particularly shall I remember the sounds of voices of those with close ties to our town -- Sunshine Sue and the Rangers, Captain Edgerton, Pauline P. Mayo, Eddie and Martha Adcock, Mary Pearl and Sarah, Robbie Limon, Maynard Jones, and others!" As the old song goes, "All I want is loving you and MUSIC, MUSIC, MUSIC." While one can't readily determine when or if there is a lot of music in the air, in Scottsville there certainly is a lot of MUSIC, MUSIC, MUSIC! Music presumably has been around since the first caveman picked up a stick or a bone and began beating it on a log or a fellow caveman discovering the sound it made. The four main periods of music are the Baroque (1600-1750), the Classical (1750-1825), the Romantic (1825-1900), and the Modern period (1900-present). Fortunately for mankind when one period led into the next, the prior period did not cease to exist. We are fortunate today to be able to enjoy the music of all four periods. Scottsville, having been founded in 1744 as Scotts Landing, has encompassed all the musical periods and continues to enjoy a vibrant and ever expanding musical scene. No doubt the earliest settlers enjoyed music from their homelands. Local inhabitants most likely sang ballads and danced to reels, and as the population grew, the music of the area and of the entire new country evolved. Additionally, "home grown music concerts" were much enjoyed entertainment in Scottsville in the early 1900's. Guitars, harpsichords, violins, banjos, and pianos were popular instruments of the day playing waltz and two-step dances at local parties and dances. Nettie Cash Turner (a relative of Johnny Cash) played in the Turner Family 'combo' Band and made regular appearances at Fluvanna Lake and the Canal Basin Warehouse. Mary Turner Cook and Sara Anderson Roberts were a popular local singing duet. Victory Hall hosted many big names and those soon to find their fame in the music industry. Maybelle, Helen, June, and Anita Carter played there. Virginia Patterson Hensley, who later changed her name to Patsy Cline, played Victory Hall. Then there was Sunshine Sue and members of the Old Dominion Barn Dance sponsored by WRVA Radio in Richmond, who, according to Robert Spencer, "loved Scottsville and always looked forward to playing here." And of course, the previously mentioned Eddie Adcock continues to play here also. Today the music scene in Scottsville is both vibrant and growing. Opportunities abound for both enjoying and being part of the musical experience. Nightly there are individuals performing at the Horseshoe Bend Bistro and Taproom as well as the Tavern on the James. Through an agreement between the Scottsville Center for Arts and Nature and the locally owned and operated Ravensworth Recording Studios, the Victory Hall Theater has become the arena for almost weekly musical performances by both local and nationally known groups. On both September 16th and 23rd, there will be fund raisers for the Howard H. Anderson Trail. Mark Templeton and Pocket Change will perform on the 16th while the Little Mountain Boys will play on the 23rd. October also offers a full schedule of musical performances with the aforementioned Eddie and Martha Adcock in concert on October 27th. Check the Victory Hall schedule for the complete list, as there is something going on every weekend. The James River Arts Council offers classical programs usually at the Scottsville Presbyterian Church. There are also a number of venues available for local musicians who just want to "get together and play some music." On the second Friday evening of each month at 7pm, some ten to twenty mostly amateur musicians assemble at Victory Hall to play "old time" and the bluegrass music with an occasional more modern number thrown in. This is a community event and is free and open to the public. Skill level is irrelevant. If you show up with an instrument, or just want to sing you will be welcomed. Some of the "Victory Hall Bunch" reconvene at the Scottsville United Methodist Church on the second Saturday of each month to not only enjoy a great dinner, but to entertain those assembled with a selection of Gospel favorites. Again, this is a free event open to the entire community. Every other month, a group, made up of participants in the previously mentioned activities, meets at the Scottsville Apartments to play for the residents. As many of the residents there have either mobility or transportation issues, the music is brought to them, and everyone involved has a grand time. Nashville might be known as "Music City," but all you have to do is take a look at Scottsville's musical history, its current musical atmosphere, and the musical future that is evident, and you will quickly see that Nashville doesn't have a corner on the market.